Interactive 9.8.1 Visit the Best Bones Forever!™ website. Explain why it is important to build peak bone mass when you are young. Identify the tests used to measure bone mass. Although the symptoms of osteoporosis do not occur until old age, osteoporosis is referred to as a childhood disease with old-age consequences. Thus, preventing osteoporosis in old age begins with building strong bones when you are growing. Remember, the more bone mass a person has to start with, the greater the loss a person can withstand without developing osteopenia or osteoporosis. Growing and maintaining healthy bones requires good nutrition, adequate intake of minerals and vitamins that are involved in maintaining bone health, and weight-bearing exercise. Actions taken to avoid developing a disease before it starts are considered primary prevention. Primary prevention of osteoporosis begins early on in life. About one-half of mineralized bone is built during puberty and the requirements for calcium intake are higher at this time than at other times in life. Unfortunately, calcium intake in boys and girls during adolescence is usually below the recommended intake of 1,300 milligrams per day. To combat inadequate nutrition and physical inactivity in adolescents, the US Department of Health and Human Services launched the Best Bones Forever!™ campaign in 2009.US Department of Health and Human Services. Best Bones Forever! Last updated September 2009. http://www.bestbonesforever.gov/index.cfm This campaign is focused on promoting bone health, especially in girls, and reducing the incidence of osteoporosis in women. An article in the October 2008 issue of Food and Nutrition Research concluded that there is extensive evidence that when girls and boys exercise they increase their peak bone mass and build a stronger skeleton. The greatest benefits to bone health were observed when exercise was combined with good nutrition.Karlsson, M. K., A. Nordqvist, and C. Karlsson. “Physical Activity Increases Bone Mass during Growth.” Food and Nutrition Research 52 (Published online October 1, 2008). doi: 10.3402/fnr.v52i0.1871 Because there is such a strong correlation between peak bone mass and a decreased risk of developing osteoporosis, the main thrust of organizations that promote bone health, such as the National Osteoporosis Foundation, is to provide information on how to increase skeletal health early on in life, particularly during the time period of peak bone growth, which is puberty. Eating a balanced diet throughout life is helpful in preventing the onset of osteoporosis and deleterious fractures in old age. There is ample scientific evidence to suggest that low intakes of calcium and vitamin D in adulthood are linked to an increased risk for developing osteoporosis. Therefore, it is essential to make sure your diet contains adequate levels of these nutrients. The roles of calcium and vitamin D in maintaining bone health are discussed in detail elsewhere in this chapter (Chapter 9.4). A high phosphorus intake coupled with a low calcium intake may contribute bone loss. It is better if your diet contains the appropriate amount of calcium, phosphorus, and protein. Mechanical stress is one of the activation signals for bone remodeling and can increase bone strength. Exercises that apply forces to the bone increase BMD. The most helpful are weight-bearing exercises such as strength training with weights, and aerobic weight-bearing activities, such as walking, running, and stair climbing. Certain aerobic exercises such as biking and swimming do not build bones, although they are very good for cardiovascular fitness. The importance of weight-bearing exercise to bone health is seen most clearly in astronauts. Investigators who analyzed the BMD of astronauts found that typically it decreases by 1.8 percent every month in space. That means during a six-month stay at a space station an astronaut may lose greater than 10 percent of their bone mass. The lack of gravity, which tugs on the bones of people on Earth every day, is what causes bone mass loss in astronauts. NASA imposes a rigorous workout to prevent and to restore the loss of bone mass in astronauts. While in space, astronauts exercise two-and-a-half hours each day on a treadmill and use a resistance-exercise device where they pull rubber band-like cords attached to pulleys. Then, when they return to Earth astronauts undergo weeks of rehabilitation to rebuild both bone and muscle tissue. Reducing the number of falls a person has decreases the likelihood of sustaining a fracture. Fairly simple modifications to a person’s environment, such as installing nightlights, railings on stairs, bars to hold onto in showers, and removing cords and throw rugs in walking paths can significantly reduce the likelihood of falling. Importantly, people at risk should have their vision and balance checked frequently. A person who has undergone a DEXA scan and been diagnosed with osteopenia or osteoporosis has multiple strategies available to reduce the chances of breaking a bone. These types of treatment strategies are referred to as secondary prevention. The OSG reports that the primary goals in the prevention and treatment of osteoporosis are to maintain bone health by preventing its loss and by actually building new bone.Office of the Surgeon General. “Bone Health and Osteoporosis: A Report of the Surgeon General.” October 2004 http://www.surgeongeneral.gov/library/bonehealth/chapter_9.html To accomplish these goals, the OSG recommends a pyramid approach. The base of the pyramid focuses on balancing nutrition, increasing physical activity, and preventing falls (primary prevention tactics). The second step in the pyramid is to determine if any underlying disorders or diseases are causing osteoporosis and to treat them. The third step is pharmacotherapy and involves administering medications. The second and third steps in the pyramid are secondary prevention tactics. We have noted that certain medications and diseases either cause or aggravate osteoporosis. Treating diseases such as hyperparathyroidism or discontinuing the use of or lowering the dose of medications such as prednisone, substantially reduces the risk of further deterioration of bone tissue and fracture. (In Section 9.3 of this chapter, you learned the mechanics of how the parathyroid hormone regulates calcium homeostasis.) When parathyroid hormone is present at continuously high levels in the blood, it causes a marked elevation in calcium levels. It raises blood calcium levels by increasing osteoclast activity, thereby increasing bone breakdown and bone loss. Hyperparathyroidism is treated by the surgical removal of the parathyroid gland tumor. Chronic kidney disease and vitamin D deficiency can also cause an increase in parathyroid hormone levels. When the increase in parathyroid hormone is the result of disorders in other organs, the condition is referred to as secondary hyperparathyroidism. Treating diseases such as chronic kidney disease and Crohn’s disease, which are associated with decreased activation of vitamin D, increased calcium excretion, or malabsorption, is important in people who have not developed osteoporosis yet in order to arrest further losses in BMD. If these types of conditions exist simultaneously with osteoporosis, it is recommended that both disorders be treated to prevent further bone deterioration. Osteoporosis is a childhood disease with old age consequences. Primary prevention of osteoporosis begins early in life with proper diet and exercise. The strategies of secondary prevention that focus on treating osteoporosis aim to arrest further bone loss and reduce fracture risk. 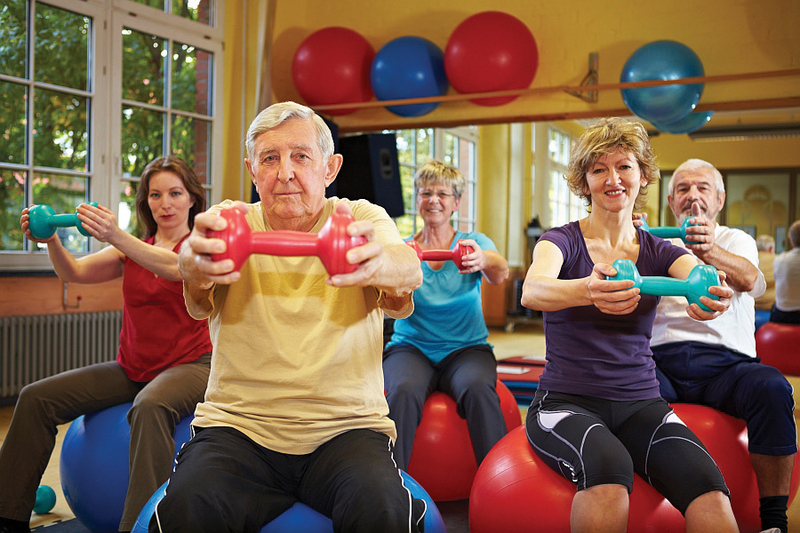 Osteoporosis prevention and treatment involves a three-tiered approach that incorporates lifestyle modifications, the assessment, and treatment of underlying causes of the disease, and pharmacotherapy. Do you or any of your classmates have children? What could a parent of a teenager do to help their child achieve a high peak bone mass? Discuss the tactics you might employ at your age to maximize your bone health and minimize your risk for developing osteoporosis.